1) Ring-tailed lemurs are in fact primates, so they are related to all sorts of monkeys as well as to humans. However, they are not of the simian order of primate; they are what’s known as Strepsirrhine primates, typically regarded as less intelligent than simians (although, that has recently been debated). 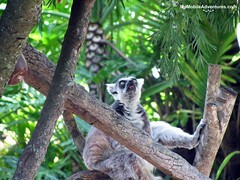 There are several different kinds of lemur, and all of them hail from Madagascar. 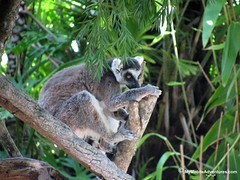 2) Ring-tailed lemurs like to sunbathe, and are often found doing so sitting up in the Lotus position. The sunbathing is to warm themselves during the day, but at night they sleep all piled up with one another to share warmth. Such a sleeping pile is called a “lemur ball”. They are usually found moving about on all-fours (quadrupedal), but are also capable of standing on hind legs for short periods. Whenever I’ve seen one walking around, they’ve usually sort of stalked along, similar to a cat or a raccoon. 3) While most lemurs are nocturnal, the ring-tailed lemur is dirunal – like (most!) humans, they are awake during the day and asleep at night. They are very social and live together in troops of about 30. The most lemurs I’ve seen at Disney is two, and I often wonder if they miss living in a big troop, and what Disney does for them to help compensate for socializing with the troop. I hope to remember to ask around next time I’m there. 4) Ring-tailed lemur troops are female-dominant. This is true of all types of lemurs. The hierarchy of females in the troop is not inherited; you don’t get to be the top mama lemur just because your mother was. Oh my gosh, this was so interesting, and the photos are super. Mine is posted now…it’s a ‘MAN OF WAR’. Creepy, slimy, icky. Very interesting! And I bet they are a lot of fun to watch. 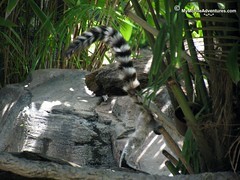 Great info on the ring tailed lemur. I believe I have seen them at the National zoo in DC. Cute lemur! I loved to know more about this lovely friend, thanks a lot! I do love lemurs. Too bad they are having such a hard time in their native Madagascar. Loved the post. wow! what a very interesting post, thanks for the information. Lemurs are a fancinating looking animal. The stink story is funny. You’re posts are always so informative… thanks for taking the time to share it with us! 5)Soak their tails in scent…well, I am known to put on a bit too much Agent Provacateur, but hey, the male lemurs go gaga over it!